With Rock The Shores, Squamish Music Festival, and Pemberton Music Festival all cancelled, live music in B.C. seems a little bare this year compared to past summers. Fortunately, Victoria is one of many Canadian cities boasting the week-long TD International Jazz Festival. Here are 5 up-and-coming artists to check out at this year’s Jazz Fest — no camping or Birkenstocks required. Though her debut EP suggested Springs’ style would consist of a blend of hip-hop and R&B, 27-year-old Kandace Springs has now completed a 90 degree turn in terms of musical direction and has become immersed in the world of soulful jazz. Springs has been dabbling in pop, classical, and jazz music since her early childhood in Nashville, and you can find nuances from each genre in her most recent album “Soul Eyes”. Those influences are also audible when Springs is live on stage with her trio which includes drummer Dillon Treacy and bassist Bielenberg. Highly prolific as a pianist and singer, Springs’ silky yet fiery alto tone soars with a genre-defining tenderness that combines influences of Ella Fitzgerald and Billie Holiday with a refreshingly millennial sound. The Kandace Springs Trio play at the MacPherson Playhouse at 7:30 p.m. on Monday, June 26. Describing themselves as an “accident”, this Toronto trio found themselves on stage together for the first time in 2010. Since then, their uncanny chemistry and innovative approach to jazz has led them to international recognition and four albums’ worth of original compositions. What distinguishes this group is their willingness to explore and expand independent melodic and rhythmic ideas within each of their tracks; moving beyond expectation or prediction without ever losing control of the imagery that is being created. This is a group that demonstrates true contemporary jazz at its finest. Myriad3 play at Hermann’s Jazz Club at 8:30 p.m. on Monday, June 26. Perhaps the most unique performer in this year’s jazz fest, Jacob Collier has been redefining and cultivating a style that can only be called a true, all-encompassing fusion since his early days posting videos on YouTube. Now a two-time Grammy-award-winning artist, the 22-year-old from North London, U.K. is set to make his Victoria debut as a part of his international one-man-tour. His radiant, multi-dimensional arrangements and his rare vocal ruggedness make it clear that this aggressively fresh artist is set to have a legendary career ahead. This is music making that undoubtedly defies the concept of “less is more”. 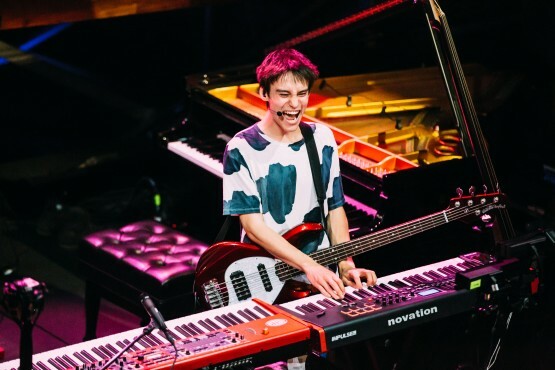 An Evening with Jacob Collier takes place at the MacPherson playhouse at 7:30 p.m. on Thursday, June 29. Led by Victoria’s own Quinn Bachand, Brishen are known to capture and blend a range of historical jazz and swing era styles. Playing more than a dozen instruments himself, 21-year-old Bachand leads a group of equally virtuosic musicians. With influences ranging from traditional Celtic music to Django Reinhardt-esque jazz, Brishen introduce a technicolour future to a black and white past. Masterful narration meets captivating new spins to every genre Brishen re-create. Quinn Bachand’s Brishen play at the Dave Dunnett Theatre at 8 p.m. on Saturday, June 24. With a wide-eyed sweetness that complements the brightness and sincerity of her voice, Barbra Lica’s career as a somewhat unconventional jazz singer took flight immediately after graduating from the University of Toronto in jazz performance several years ago. Peppy but subtle, she represents an undeniable happy medium between the worlds of pop and jazz. Lica tends to perform a mixture of original songs with timeless jazz standards, all of which are accompanied with a bubbly personality and equally curious quintet. Barba Lica will perform at Hermann’s Jazz Club at 8:30 p.m. on Tuesday, June 27. Tickets for all the shows mentioned above are available at jazzvictoria.ca.